Whether you’re late-night browsing and your screen is too bright, or you’re sitting outside and the screen is too dark, adjusting the brightness on your tech devices can often be a struggle. 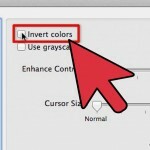 To solve this problem, invert the colors of your screen to ease the contrast on yours eyes. Go to System Preferences->Keyboard->Shortcuts, look under the Accessibility section, you need to turn on Invert Colors by checking the box. 1. Go To Settings. When you’re at the settings, scroll down to the tab that says General. 2. Accessibility. 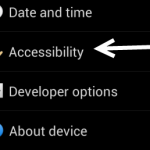 Once you’re at the General settings, scroll all the way down to Accessibility. 6. Triple Click Home: Go back to the home screen and to invert your colors press the home button three times fast to invert colors and three times fast to go back to normal. 1. 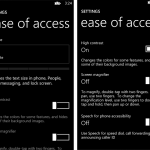 From the app list or the live tile, choose Settings to continue. 2. Scroll down near the bottom of the screen, and tap on the ease of access option. 3. 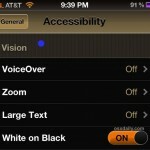 In the ease of access screen, you will find the high contrast option. Move the slider to the right to turn this feature on. If the background of the slider turns from black to the theme color, the option is activated. By turning on this option, colors for most tiles will be changed. 4. Come back to the live tile to see the changes. All tiles have turned black with white icons on them. 5. In contrast, the normal theme is colorful. The high contrast theme can be extremely useful to preserve the battery, especially on an AMOLED device like Lumia 820. It also makes using the phone outdoors easier. Who doesn’t love life-hacks? RedOrum has got you covered. We have compiled a list of technology related tips to make your life easier. Follow @RedOrum on Twitter or like us on Facebook and you’ll be guaranteed a new tip every Tuesday.